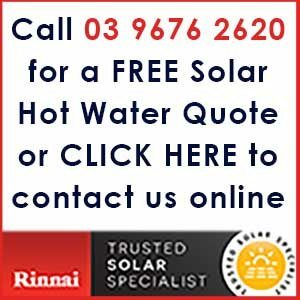 To help with the purchase of your new Rinnai Solar hot water system, both the Federal and Victorian governments have solar hot water rebates which significantly reduce the cost of purchasing and installing your system. There are two main rebate schemes that you may be eligible for are Small Scale Technology Certificates (STCs) and Victorian Energy Efficiency Certificates (VEECs). As these rebates can sometimes be difficult to navigate through and claim, Living Solar has made it easy for you by offering an upfront ‘point of sale’ discount on the purchase price of the system. Under the Small-scale Renewable Energy Scheme, eligible small-scale renewable energy systems are entitled to a number of STCs. The number of STCs that can be created per system is based on its geographical location, installation date, and the amount of electricity in megawatt hours (MWh) that are displaced by the solar water heater over the course of its lifetime of up to 10 years. As a guide, one STC is equal to one megawatt hour of eligible renewable electricity displaced by the system. You can calculate the number of STCs a system may be eligible for using the small generation unit calculator and solar water heater calculator or let Living Solar do the work for you. We can deduct the value of your STCs from your purchase price, making the upfront cost of your system cheaper. The Victorian Government offers a similar scheme to STCs as an extra incentive for a household to reduce their energy consumption. Rebates are available on a wide selection of products, including solar hot water systems. By replacing an existing electric or gas hot water system with a solar system you may be eligible for VEECs. The number of VEECs that can be created per system is based on its geographical location, installation date, and the amount of energy that is displaced by the solar water heater over the course of its lifetime. You can calculate the number of VEECs a system may be eligible for using the calculator tool here or let Living Solar do the work for you. We can deduct the value of your VEECs from your purchase price, making the upfront cost of your system cheaper.